I recently called around the local fish mongers looking for trout only to hear over and over, "ha, no we don't do trout." It was as if I was asking for an alien. 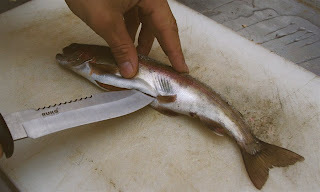 Then I heard a contestant on Top Chef last season say that cooking with trout was a joke and no respectable chef would do so (or something along those lines.) Please, someone tell me what's embarrassing about cooking a beautiful, delicious freshly caught trout? If you ask me, if you can't make a simple trout taste terrific, perhaps you shouldn't be a "respectable" chef in the first place. Last summer we stayed at a charming fishing resort in the Okanagan called Postill Lake Resort. Postill Lake is a world renowned fishing resort and although we are not avid fishermen, circumstances placed us in a lovely lakefront cabin. My boyfriend and my nephews went fishing all day long. They had a blast. I was even more excited when they came home with some freshly caught trout. I lightly seasoned it with salt and pepper and broiled it for a few minutes. I kid you not, it was one of the best things I've ever tasted. I suppose I have a problem with anyone being a food snob. In particular when you're talking about fresh food. It's one thing to snub macaroni from a box (which I'll admit to loving every once in a while) but to consider yourself too good to offer up a fish freshly caught from the lake, that's where I draw the line. I had no idea that trout was so declasse! Their loss I say :) that photo is fantastic. I missed that comment on Top Chef. Of course they obsess over Chilean seabass instead, which is terribly overfished and potentially laden with mercury. You are so funny, I laughed when I read your comment! Thanks for the compliment on the photo. you just have to love the irony of it all, don't you, jeez! That comment by the Top Chef contestant really irked me. I'm happy you both stopped by.